Amazingly (and uncharacteristically), I was able to get back to sleep as soon as I got on board and took my seat (confession: both a scarf wrapped around my face and a hoodie in the up position were required to achieve sleep; it was a strong look), so did Mrs. London and so did my mother and brother. It probably helped that our blocks of seats were scattered about different cars, you know, no chatting temptation. The only two that didn't sleep were Gregory and Mr. London, but I'm sure that none of you are surprised by this. As soon as the TGV pulled away from the station, they found each other, went to the bar car for coffee (bye, bye, nighty-night-night) and then proceeded to look for people to play cards with them (their Phase 10 addiction is borderline compulsive). "No, Mr. & Mr. Crazy Pants, no one wants to play cards with you two at 5:30 in the morning!" 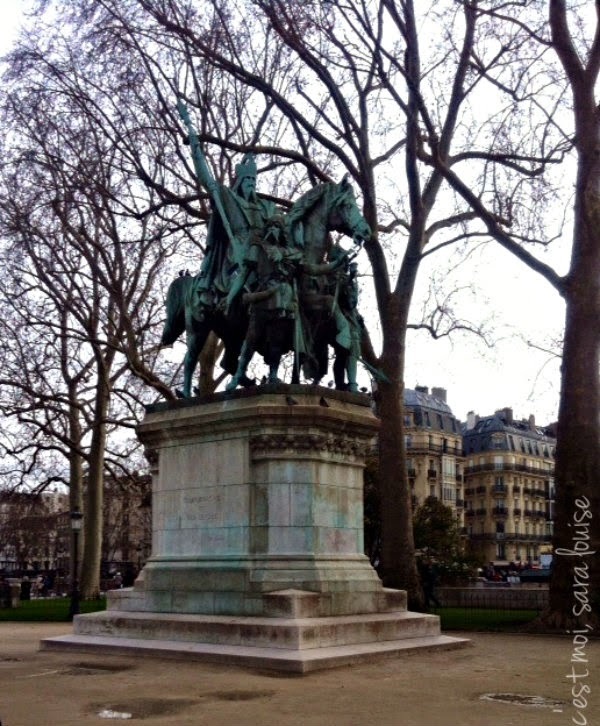 A little after 9AM, we pulled into Gare de Lyon fairly bright eyed and bushy tailed (well four of us were anyway, I'll give you three guesses who the two Grumpy Butts were), and taxied to our hotel in the Seventh to drop off the luggage. We had lots to see and not a lot of time. First up was food. After four years in France I finally got to eat something that had been evading me... BRUNCH! Yes boys and girls, Paris does Brunch. I heart you Paris, I really do. Thanks to a recommendation from Danielle, we brunched at Le Nemrod, an Auvergnat restaurant in the 6th. (Auvergnat means it's from Auvergne as in Clermont where Gregory grew up... it also means lots and lots of cheese and potatoes). I ordered a Kir Royal for apéro and my meal came with a cup of coffee (like an American cup of coffee, not a teeny, tiny, two sips kind of thing), and a glass of Beaujolais. The waiter brought all three at once. Huh. After I finished my array of liquids, we set off to Musée d'Orsay, winding up and down streets until the tiredness took hold and we waved down a taxi (personally, I blame the cheese and potatoes for the sluggishness). But before the taxi, we passed this plaque (which basically says that this guy, Jean Baptiste de Blah Blah, was living here when the King called him up and said he had to go to the American Colonies to help out G.W. and the riff raff). So after four years of teasing, Gregory finally got the revenge he had been seeking. He looked at me, smiled, and said, "you're welcome." Whatever. P.S. 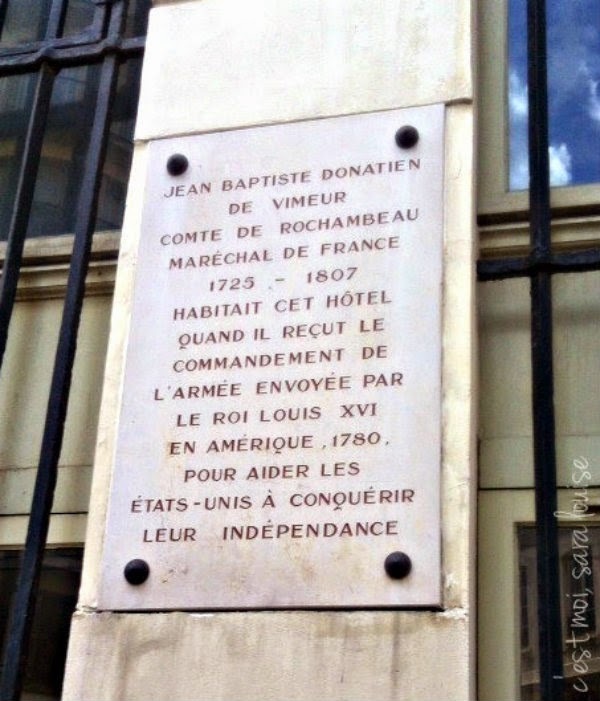 À: Jean-Baptiste Donatien de Vimeur, Comte de Rochambeau, merci pour votre aide. That's quite the name you've got there, Monsieur Fancy Pants. Good job being able to sleep in the train. I am never able to sleep in trains, planes or whatever, no matter how tired I am. Brunch - so critical and sadly so not a thing in so many places! I enjoyed your post very much ~ You have such a unique style of writing that is so engaging! I'm going to be in Paris (for the first time) for a few nights at the end of the month. The Musee d'Orsay is on my very brief list. We're mostly going to walk around and absorb it. Have a good one! Oh dear - men always think that they can do without sleep!!! We weren't in Paris for brunch, so we missed out, but petit dejeuner was my favorite thing ever. I am not even surprised the boys refused to sleep - men swear they can roll without it, but then are the biggest, crankiest babies ever when they can't! Come to Williamsburg and we will show you a road - not a fancy one - that we named for Mr. Compte de Fancy Pants. We were grateful back then - not so much now, I think.